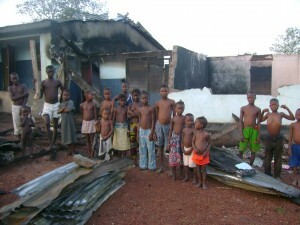 In 2009, a fire broke out at the Chidlren’s Community Village in Kamakwie, Sierra Leone, burning down one of our orphan homes and causing damage to the other… everything was destroyed from pots and pans to food and clothes. Even the new beds and mattresses that had recently been purchased were burned to a cinder. Fortunately all of the children escaped and no one was hurt. Villagers managed to throw sand and water and in the end stopped the fire from claiming the school as well. Global Angels funded the school and it is now the emergency home for the children. To top that, the rainy season has just started and the children are cold and hungry having to sleep on the concrete floors. Last year, we have also been supporting 3 meals every day for 117 children, as part of our Feed A Child Programme. For 40 children this is their first place they could call their home since losing their family. The local community are doing what they can to help the children but being rural Africa the neighbours are very poor. The rebuild was successful, and the solar panels we provided for electricity now make the buildings much safer than kerosene lamps. Thanks to all the Angels that gave.